At what point does the veneration of a composer or musical epoch stop acting as a source of inspiration and instead inhibit? A rhetorical question I know but one stimulated by the last two discs I have reviewed. Immediately before the current disc I greatly enjoyed some choral music by Herbert Howells. Howells' fascination for the Tudor period is well documented and few would argue that it did not inspire him to a raft of choral works that are fine as they are individual. For Heinrich von Herzogenberg the inspiration was the Baroque period in general and specifically the music of Bach. Undoubtedly well-crafted and deeply sincere, to my ear at least too often the music that results does not transcend the influence instead remaining reverentially inhibited in the presence of genius. In many ways this impression is reinforced by the style of the performance. This is choir-led music and the Monteverdichor Würzburg under their conductor Matthias Beckert are a fine and disciplined group but too often any sense of the spontaneous joy of music-making is submerged beneath an air of carefully rehearsed effect. In essence this is rather dull singing of rather dull music. It is all but impossible to make a comment on the playing of the Thüringen Philharmonie Gotha because their role is so secondary. On the few occasions the orchestral parts do lead the playing is all one could hope for. CPO's engineering - I was not able to listen in the SA-CD format is unfussily good - I suspect the choir which sounds fractionally recessed in the standard CD format fares better in SA-CD. 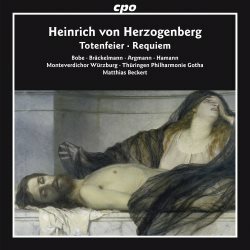 The idea of bringing together three works by Herzogenberg exploring aspects of death and the composer's response to it is interesting and valid. It has left CPO with something of a dilemma; a 2 CD set which runs to just over 100 minutes. Perhaps a special mid-price release would have made sense, issuing the set as full-price double disc seems optimistic. The work that opens disc 1 Totenfeier [Funeral Rites] is the most personal - and most Bachian - of the three. Coincidentally this was the same title Mahler gave to the first movement of his Resurrection Symphony - composed at much the same time - when it existed initially as a standalone symphonic poem. Herzogenberg's work was written in direct response to the premature death of his wife. For sure there are several impressive passages in this three-quarter hour work. The cortege-like opening has a moment that strangely pre-echoes the slow movement of Elgar's 2nd symphony. Thereafter the alternation of recitatives, arias, chorales and choruses does show just how in the thrall of Bach-worship Herzogenberg was even in this most personal of darkest hours. Right down to the use of a pair of oboe d'amore which instead of providing a unique orchestral colour simply sound sub-Bachian. There are four soloists used in the work. Indeed the quartet "Ich hab' dich eine kleine Zeit" [CD 1 track 6] is a notable highlight - really beautifully and expressively performed and a movement that shows Herzogenberg's skill at part-writing. Here, he uses another Bachian trick of giving a chorale-like melody to a solo trumpet. The gentle lyricism of the writing is skilfully understated and more effective for not trying to be grand in scale or impact - the intimacy is what registers. Curiously, CPO give no biographies at all for the soloists, simply listing them. Soprano Franziska Bobe makes the most of her solo aria Wie lieblich sind deine Wahnungen [track 8] - again benefiting from simplicity of utterance - with flute and violin solos making the illustrative most of being bird-like. Conversely, bass Jens Hamann's very first entry in his recitative and aria Herr, warum trittst du so ferne is strangely harsh and insecure - certainly worthy of another take. The closing chorale, for all its dignity and sense of resolution sounds so anachronistically out of place for 1892 - and the orchestra hear sounds weary and slightly sloppy - that even its evident sincerity cannot save it. The coupling on the first disc is the brief Begräbnisgesang Op.88 [Funeral Song]. This work was written to be performed at the graveside of one of Herzogenberg's closest friends and associates Philipp Spitta who died unexpectedly in 1894 - the composer wrote the text as well. The outdoor setting explains the use of wind instruments alone. The simple strophic character of the work; solo tenor lines being completed by the male chorus and instruments feels wholly appropriate and moving in its simplicity. Given their shared love and admiration of Bach, the quotation from the St. Matthew Passion is not unexpected. Soloist Maximilian Argmann makes a rather tight sound in contrast to the mellifluous warmth of the choir and wind and brass playing. Even though this still quotes from Bach somehow it seems the most direct and simple of the works and to my ear the most touching. The Requiem alones fills the second disc. Unusually but not uniquely in a Requiem of this scale, this work features chorus and orchestra alone - there are no parts for solo singers. Certainly Herzogenberg seems to be seeking a contemplative indeed meditative setting with none of the theatrics of a Verdi. For those who find the excesses of Verdi's setting too much this might prove a perfect antidote. I cannot help noting though that the Verdi setting predates this one by a full sixteen years. Even the original version of the Fauré, probably the most famous of the 'contemplative' Requiems - was composed earlier, and doesn't it sound more modern. I am sure that for some listeners the Bachian referencing will prove apt and beautiful. I do not mind a Dies Irae that consciously avoids any drama but I find it hard not to feel the avoidance is just a bit too self-conscious. By the time we reach the Sanctus which is just too in the debt of the B minor Mass my patience is all but at an end. The backward-looking effect seems amplified by the performing style of the Thüringen strings which seem to be embracing period practice with minimal vibrato. Again, I feel that the choir for all their technical excellence and careful preparation lack the sheer dynamic attack that could lift the music-making out of the routine into the compelling. Certainly on grounds of intonation, blend or balance they are very fine - simply rather bloodless. That being said the final movement Communio starting with the text Lux aeterna achieves a lyrical flow that is rather beautiful and a fitting end to the Mass. CPO is one of my very favourite labels who have introduced me to so much music that has enriched my life. Occasionally there are bound to be works I respond to less fervently than others. Certainly the CPO presentation is up to their normal high standards; the booklet - and the texts of all three works - is printed in the usual German and English together with the Latin setting of the Mass. CPO are continuing their recent significant improvement in the quality of the articles written for the liners. A well produced and performed but ultimately rather uninspiring pair of discs.